Simple and inexpensive materials are easy to find and fun to combine. 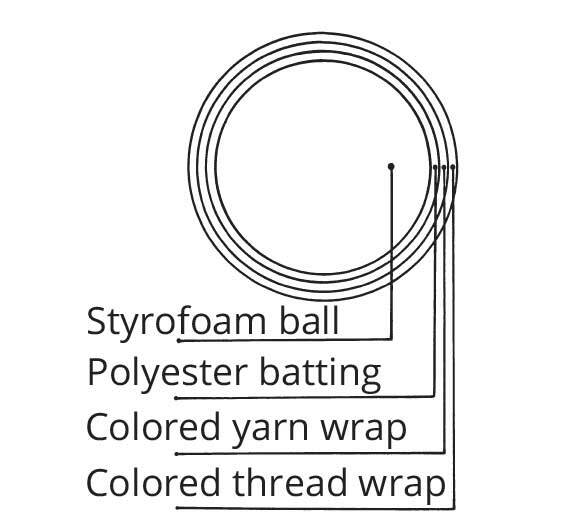 A Styrofoam® ball forms the core, a layer of batting is applied and trimmed to the ball, thin yarn is randomly wrapped over, then sewing thread is randomly wrapped on the outside of the ball. These layers produce a cushioned surface to stitch into. Preparation of a ball takes only about 20 minutes. 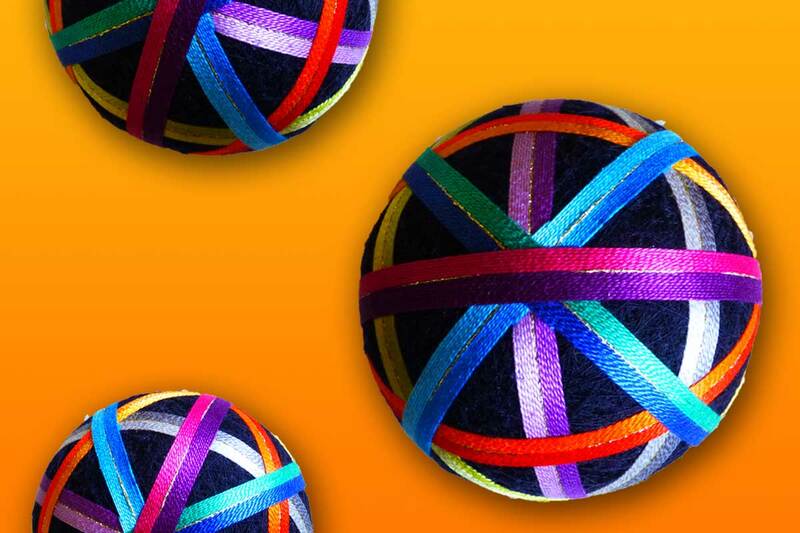 The Secret to making Temari is a plain paper strip with no numbers that will help you create all of the patterns! The strip measures the ball in different directions. Colored glass-headed pins mark the various locations necessary to create your pattern: North Pole, South Pole, and the Equator. First, the strip is pinned to the ball with the North Pole pin. The strip swivels around the ball. The strip measures the ball’s circumference, the excess strip is cut off. Then, it is folded in half. Half the length of the strip marks the South Pole. Then fold into fourths – a 1/4 of the strip’s length marks the Equator. Pins are placed around the ball against the 1/4 divisions on the strip. This line of pins creates the Equator. The strip is folded into 1/8ths, then removed from the ball. The strip is then used horizontally around the 1/4 pins of the Equator. From the 1/8 notches, 8 pins may be placed, equally spaced, around the Equator. Any number of divisions may be made around the Equator – 4, 6, 8, 10, 12, etc. Divisions are also placed between the Poles and the Equator on the mark lines. These create Cube Sides and Pentagon divisions. 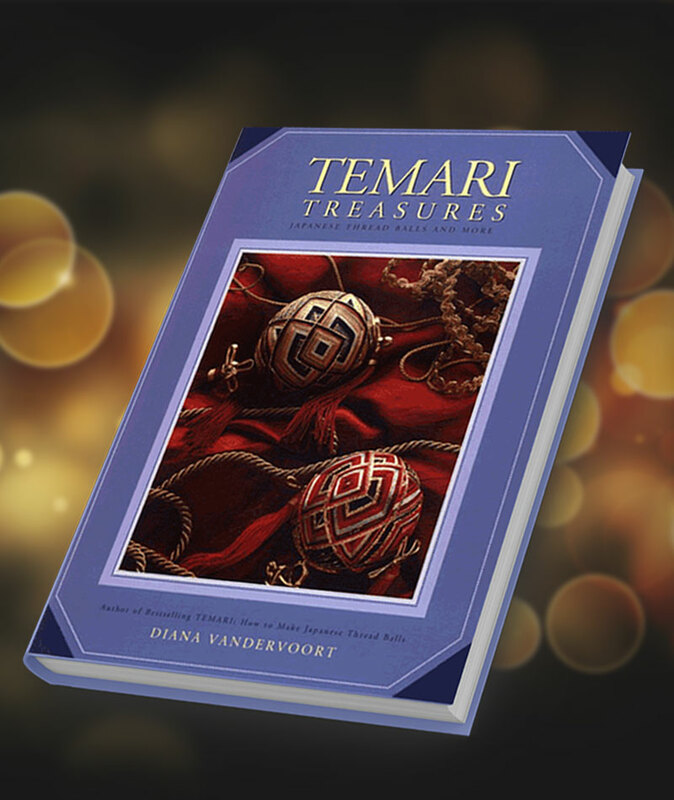 This simple method of measuring gives perfect precision to mark the patterns of Temari! 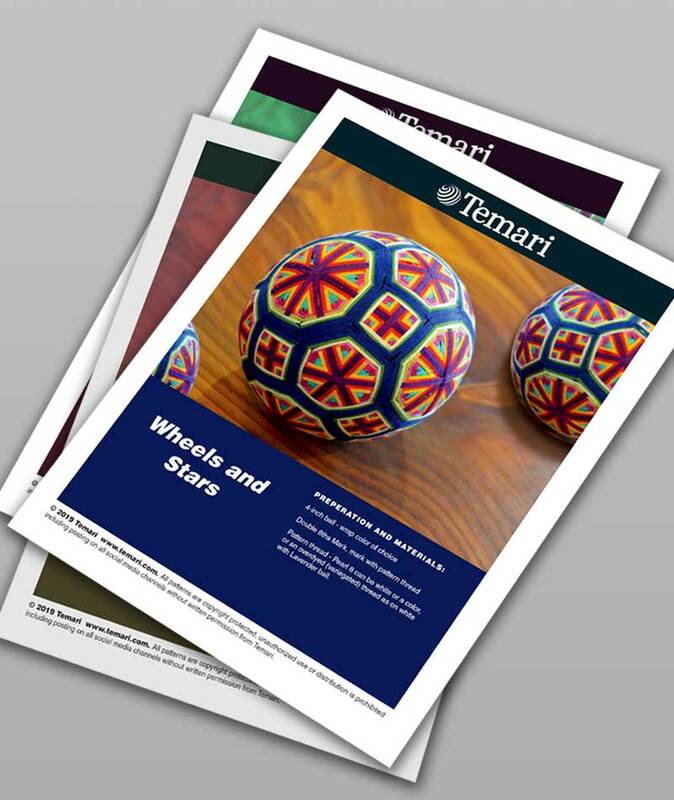 You will find many methods and many materials as you explore Temari. After preparing balls for large guild groups and classes, I found that this is fastest and most accurate for beginners. You are encouraged to find your favorite material. 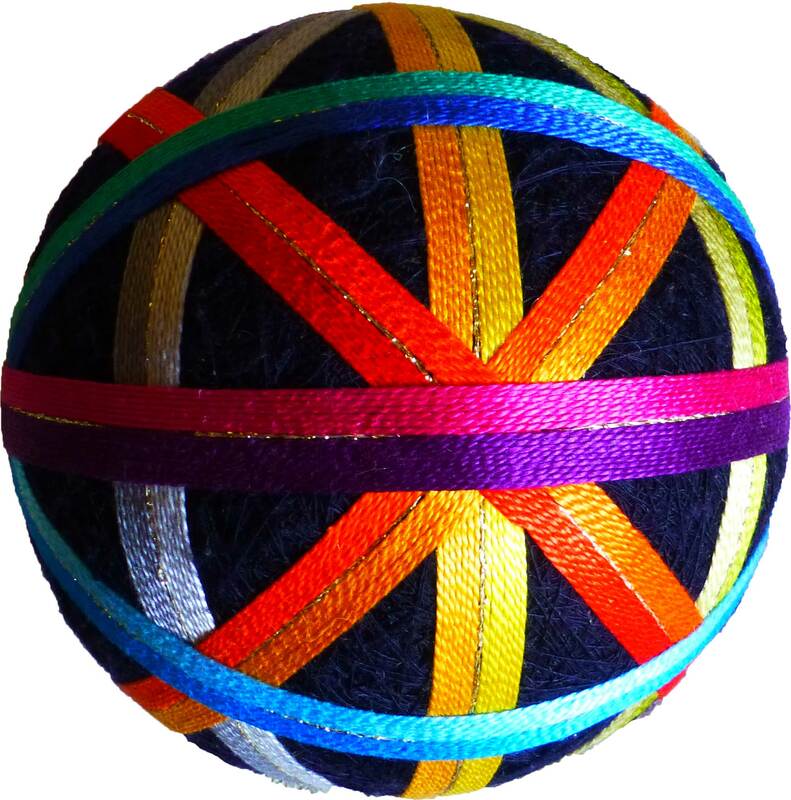 I use 3 layers of materials over a Styrofoam ball (this ball is 3” in diameter): 1/4” polyester batting, knitting machine (fine) weight colored yarn to match sewing thread, and a 200-yard spool sewing thread. Circumference measurement affects the pattern. Compare yours. Use paper strip 3/8 inch wide, 11 inches long for 3-inch ball, 14 inches for 4-inch ball. A grid of threads, jiwari in Japanese, is stitched onto the ball using Division pins as guides. The grid is used as the stitching guide for pattern threads. Explore our shop for the latest books, DVD, and individual patterns. 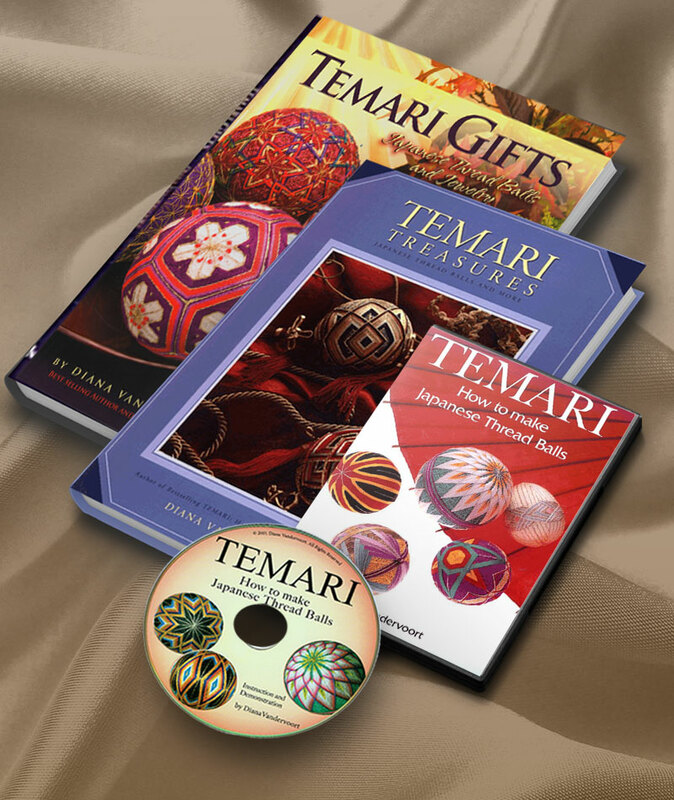 We offer step-by-step instructions on a wide variety of Temari ball patterns. Enjoy!